Today I will resuscitate a series on this blog which I thought would never see the light of day again. “You said it” is where you the reader get an opportunity to post your personal review on a product. I can’t try everything out there, although I am trying very hard, so I appreciate your reviews. PJD speaks- I had an opportunity to communicate with Just Wondering regarding the specific results or lack thereof, that she received regarding the appearance of her stretch marks. 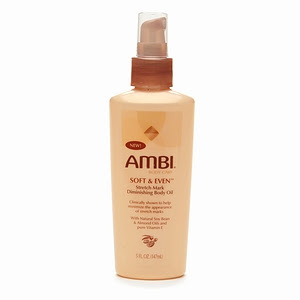 Just Wondering-“ To be honest the more I think about it I don’t think the Ambi product works for stretch marks." She used the product as directed for 4 weeks and has not seen a change in the appearance. However she credits pure cocoa butter (Not Palmers cocoa butter) with diminishing the appearance of her marks and the stretch marks of her friend. PJD- I have to weigh in just to say that I too have sniffed the Ambi Soft and Even product and I think it stinks and smells nothing like almonds..lol I just had to throw that in the mix. Please note that over time the skin on our bodies will gradually shed which will also diminish the appearance of any marks. Generally, the older the skin, the less visible the marks become. 1)Strivectin was introduced to the market as a stretch mark cream designed to reduce the appearance of both old and new stretch marks. The cream was later credited as a wrinkle reduction product in addition to stretch mark killer. Here is a review that I found online of a woman who compared Strivectin to another stretch mark product I don’t know this woman at all so there is no way for me to verify whether or not her statements are true. Even though reader L is avoiding laser surgery to remove her marks, for those of you considering the procedure please be careful. Laser surgery can lead to scarring if the dermatologist is not well versed in treating skin with a darker pigment. In essence you could be trading once scar for another. Keep the stretch mark areas well moisturized, try to not gain or lose weight too quickly and drink plenty of water to keep your body and skin hydrated. A stretch mark is a literal tear in your skin, so look for products that claim to aid in the regeneration of cells. However, check the ingredients to see if anything listed actually helps in cell regeneration. Please everyone who can help in this area, weigh in and post your experience with products that either worked or just didn’t deliver. Thanks and I hope this is helpful reader L.
Housewives of Atlanta reunion tonght at 9:00 not 10:00. There is a new blogger in the blogosphere, let's welcome Miss Young Fashion. It doesn't smell like Almonds to you. lol Well I hate anything almond related so you wont find me eating them, however I do like the effects of the Body Oil and I'm actually immune to the smell now lol Go Figure! I hope someone can give a few more remedies for this issue. Thanks Again PJD for posting my opinion! Will have to try cocoa buter, at the very least! I have had stretch marks since I was in the sixth grade-i bloomed that summer-and nothing has ever worked in diminishing the marks. I have tried everything that was recommended, combed the aisles of almost every Rite Aide, Duane Reade, etc, to no avail. I've just given up until I scrap together money to try the high end products that claim to work. So yes, if anyone does have a quick solution please share. And thank you so much PJD, really appreciate the support. hmmm good thing for that review...i can't wait for the reunion tonight! and yes, i just embraced my strechmarks. I've tried cocoa butter, shea butter, carol's daughter belly butter, Oyin belly butter and i just gave up! Nothing seems to work for stretch marks and I've just gotten used to that. *sigh* I still use cocoa butter religiously though. Thanks everyone for sharing. If anyone finds something that works, I will post it and pictures (before & after) would be great too.